Ryan Jessen thought he just had a migraine, but it turned out to worse than anyone could have ever imagined. The 33-year-old California man was diagnosed with a ventricular brain hemorrhage and quickly fell into a coma he would never awake from. While his family gathered around his hospital bed to say goodbye, they realized they were missing someone: Ryan’s best friend and devoted dog, Mollie. Luckily, the hospital agreed to allow the Jessen family to bring the dog inside to bid farewell to his buddy for the last time. 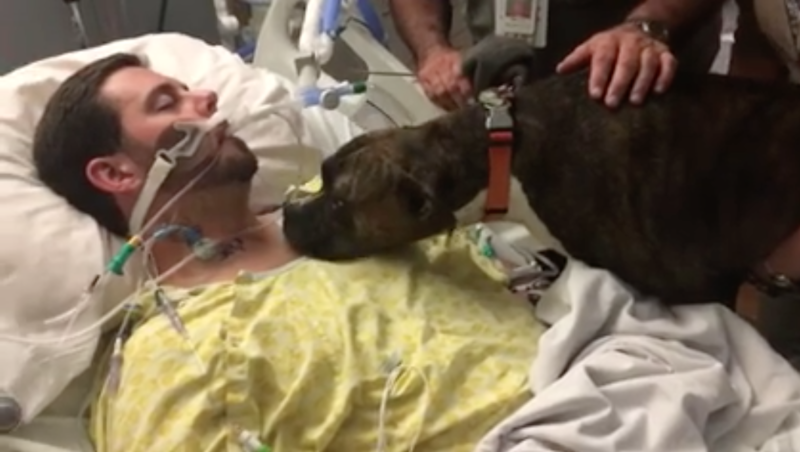 A 30-second video of the brown and white dog sniffing her owner as the man lays lifeless in a hospital bed, surrounded by tubes and machines, has gone viral with more than 12 million views since it was posted on Dec. 1. Ryan died on Nov. 30 -- just a day before the video was posted. Doctors believe the hemorrhage was caused by high blood pressure; there’s speculation that his frequent consumption of energy drinks may have contributed, Michelle explained. Though Ryan’s passing was tragic for the Jessen family, they were comforted to know that while he lost his life, he saved another. A 17-year-old boy in California, whose birthday is on Christmas, received Ryan’s heart last week, the family said. As for the dog, Michelle assured everyone that Mollie will stay in the family.